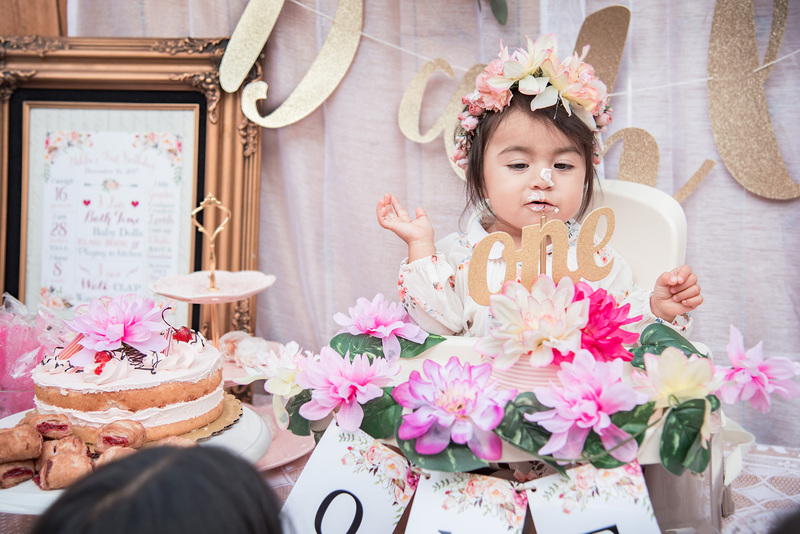 My little Dahlia is finally one! 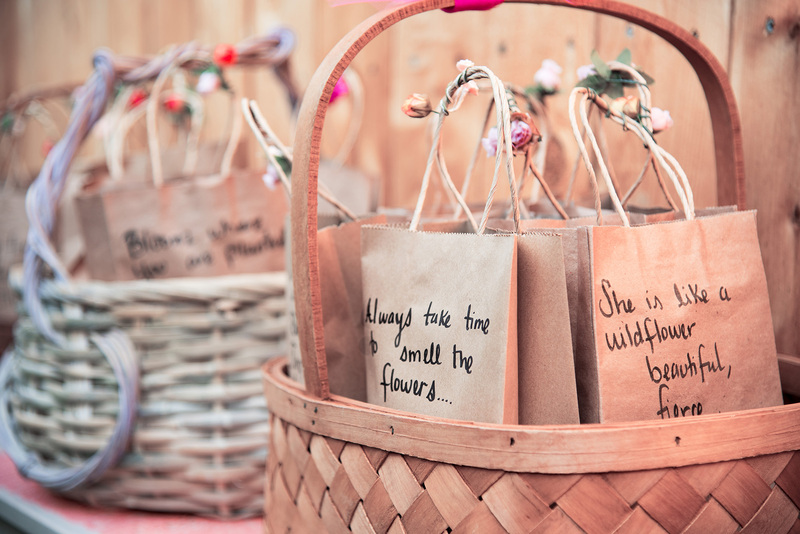 When starting to think about her birthday party I knew that I wanted it to be all about her. 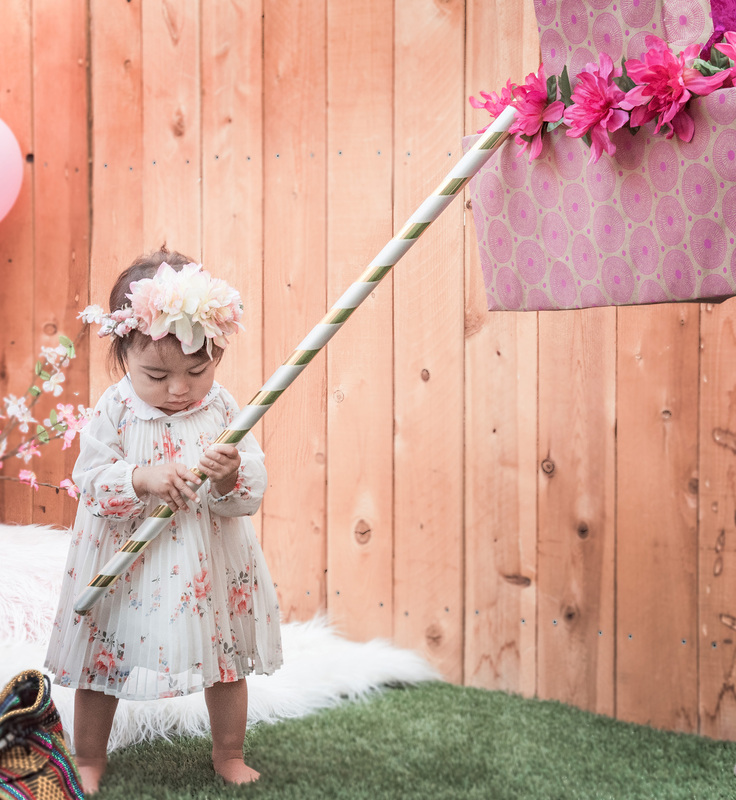 I went through some great ideas given to me by readers but in the end decided on a floral birthday party. 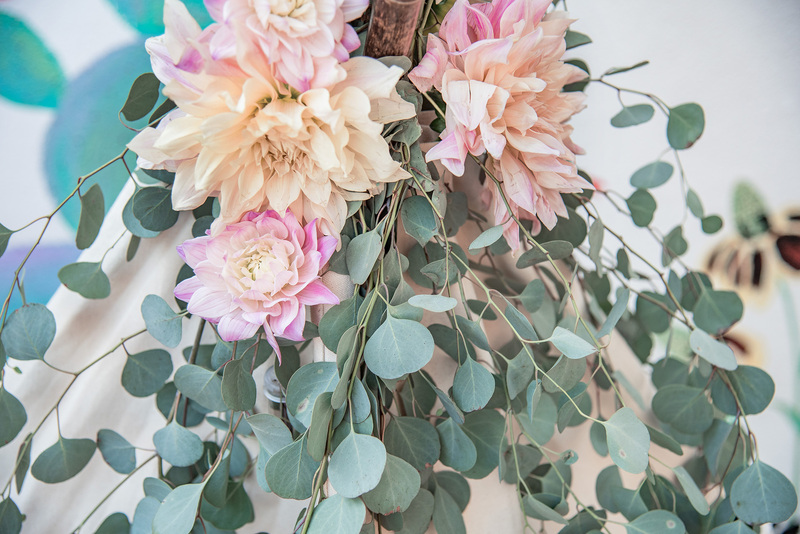 Ji’s middle name is Rose and Dahlia is a beautiful flower (plus I have about 3 feet of my body covered in rose tattoos) that it just made perfect sense! 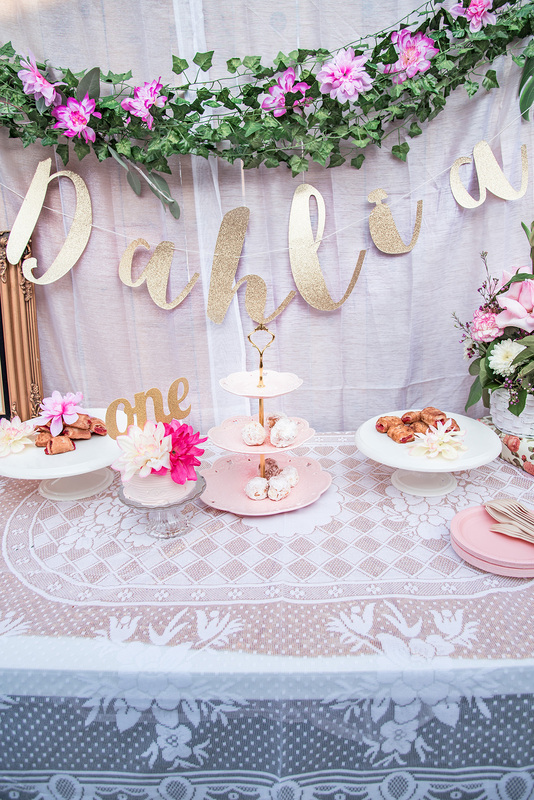 Because she is a December baby, I worried about rain and because I like to keep things simple, I decided to go with a venue that would offer both indoor and outdoor space to help bring my idea to life. 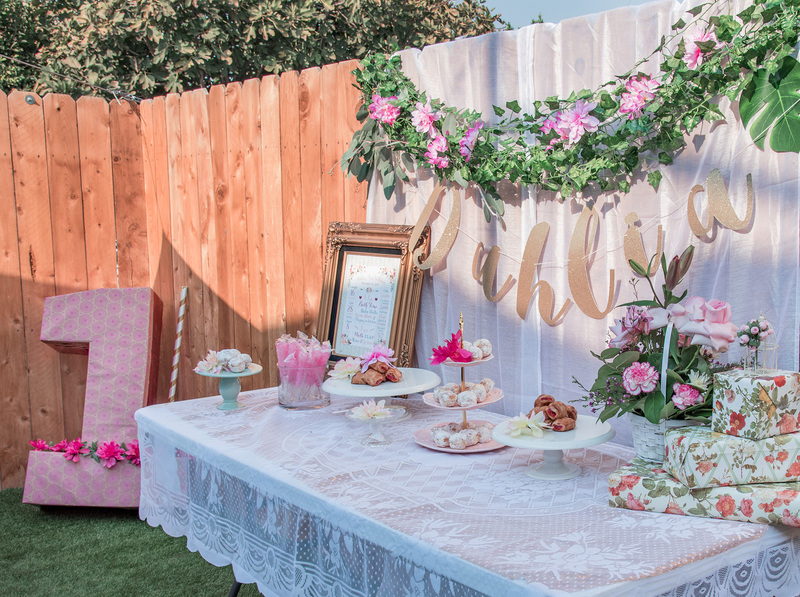 Renting out a venue is an extra expense but I did not want to stress over renting, setting up and breaking down things like canopies, tables and chairs, jumpers and having an over stimulated and tired baby at her own birthday party. Dahlia had an amazing time and I just know that she knew it was her day. 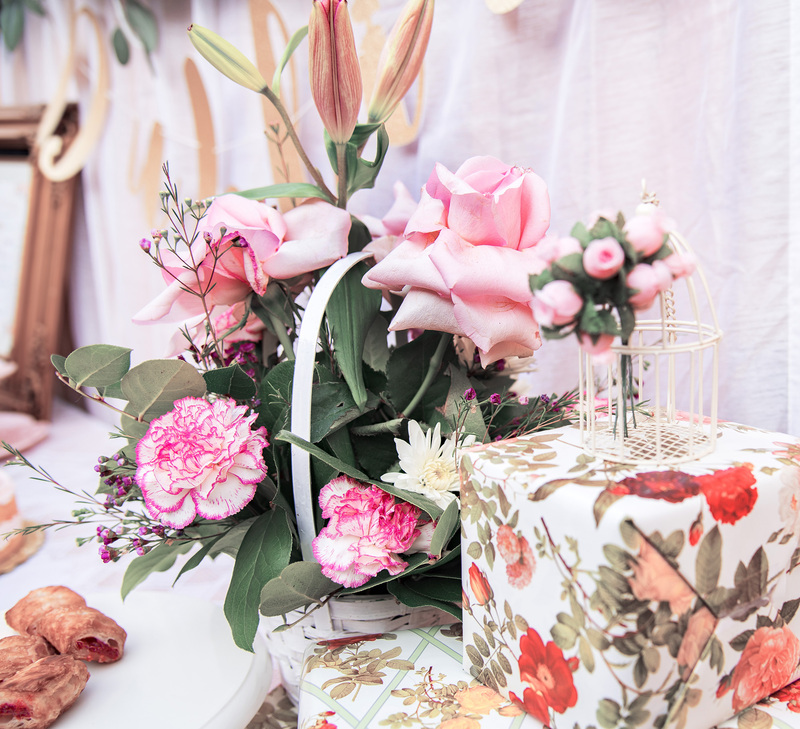 Because we did spend most of our budget on the venue, I looked for décor that was affordable yet beautiful and timeless. 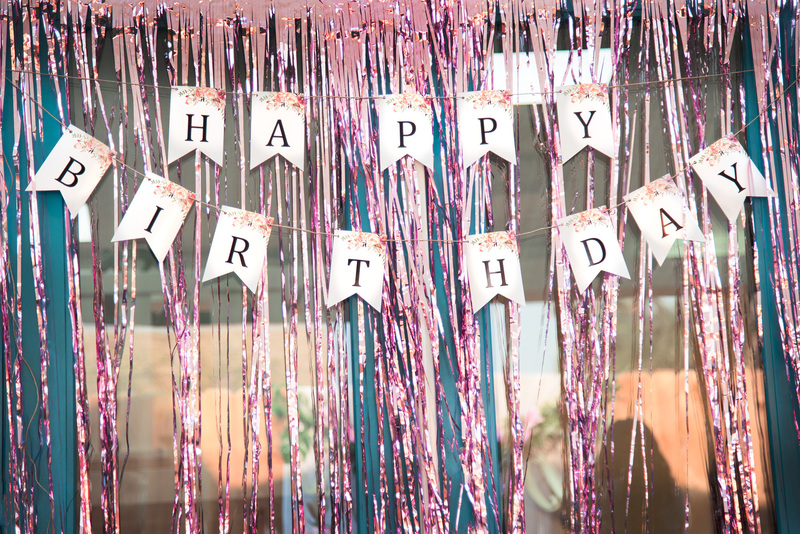 I shopped my own home and also found a lot of the floral birthday party décor at dollar stores, thrift shops and discount stores. See below for my finds! 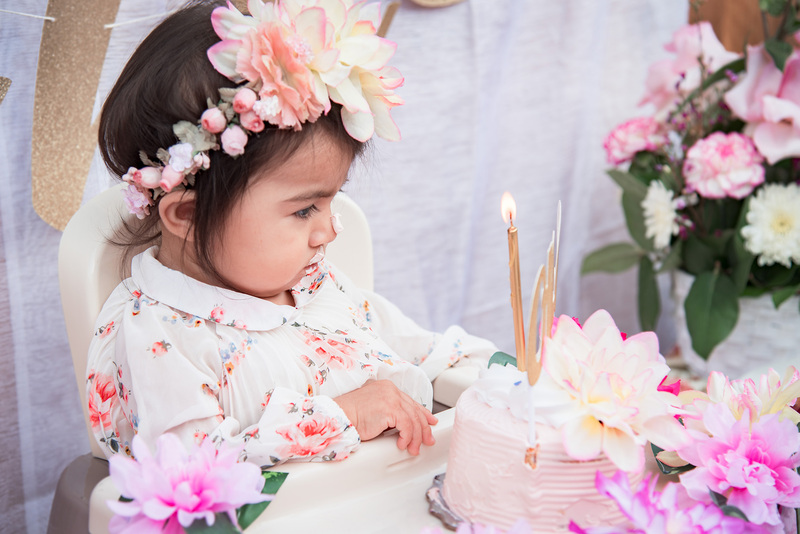 When I decided on the floral theme for Dahlia’s first birthday, I hit up my local Dollar Tree Store to look for artificial flowers to decorate with. I got really lucky because they had a wide arrangement of different color dahlias! I spent about $25 and as you will see I used them all throughout the party. Other things, I found at the Dollar Tree were gift bags made out of recycled paper (3 for $1) and wrapping paper that I used to give her piñata a mini make-over. I wanted to keep centerpieces really simple as well. 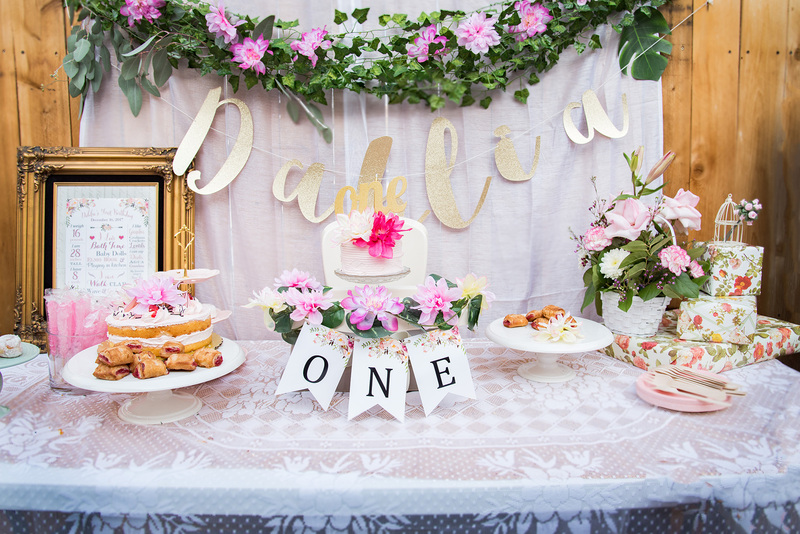 Tables start getting cluttered with personal belongings and food that they lose the look after just a few minutes of being decorated so I don’t like to spend to much time on them. 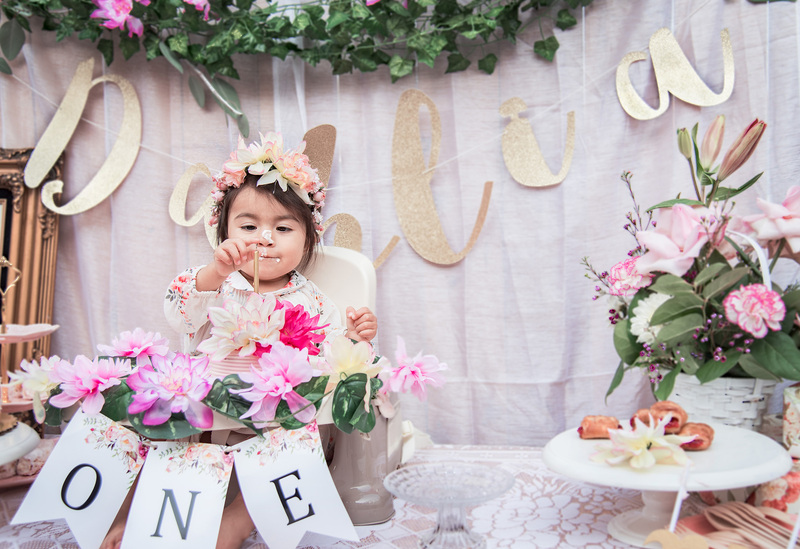 We used a couple of soda bottles I found at another dollar store and pictures from Dahlia’s cake smash photo-shoot. 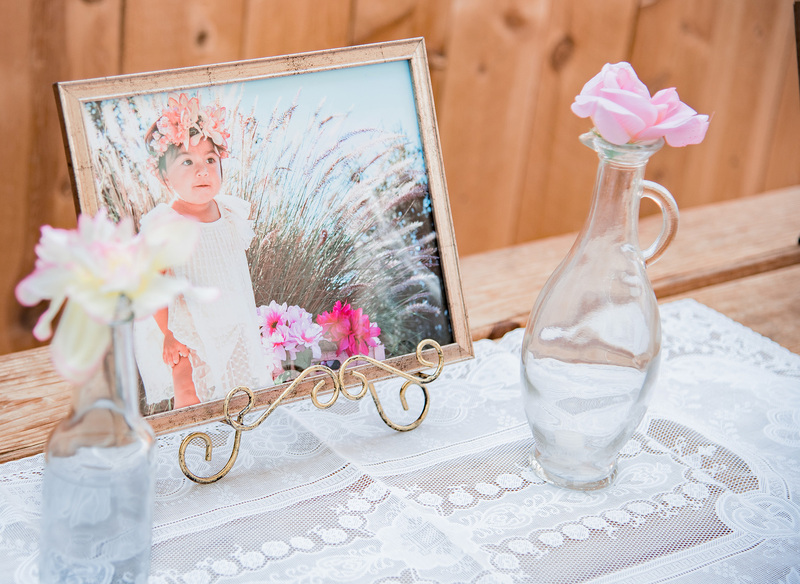 The frames and frames stands are also from the Dollar Tree. 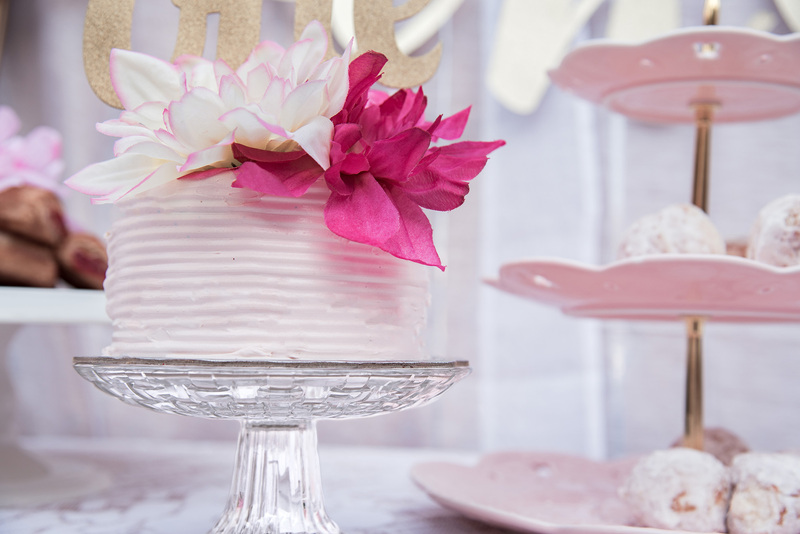 If you are having a floral birthday party or any other theme for that matter on a budget, I recommend having at least one wow factor. It’s ok to combine your simple décor found at dollar stores or thrift shops with the more expensive pieces. 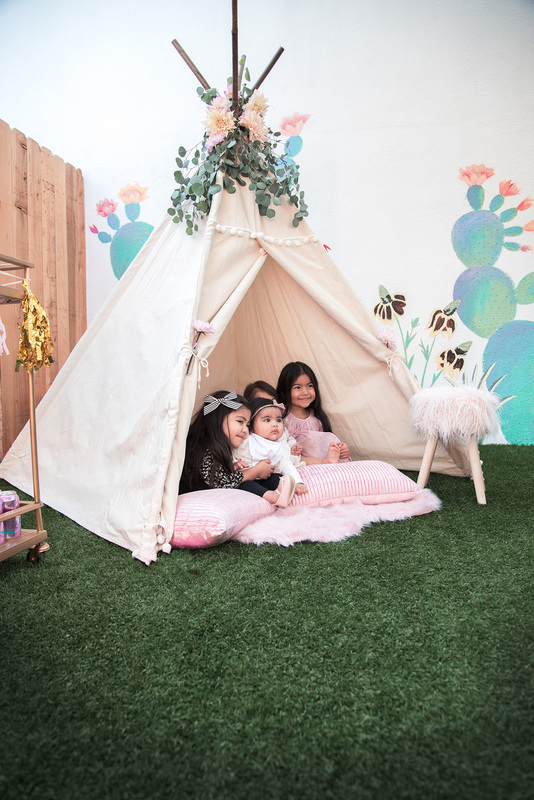 Our wow factor was the beautiful 7ft teepee provided by Sleepie Teepee. 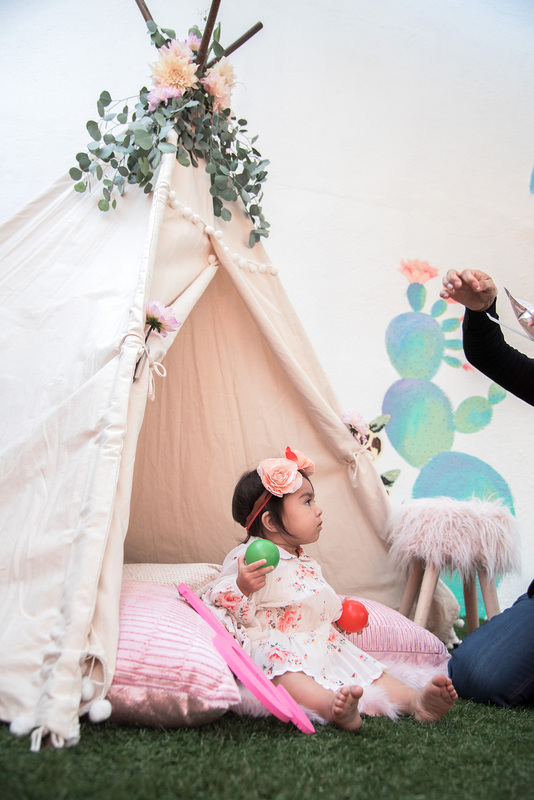 This teepee rental company is owned and operated by a wonderful mom who decorates the teepee according to your theme. 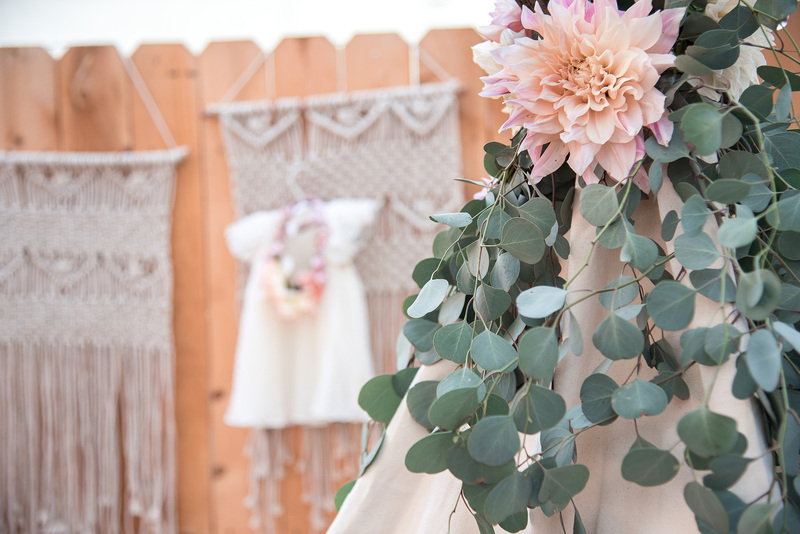 She did an amazing job decorating Dahlia’s with fresh dahlias and beautiful pink décor. 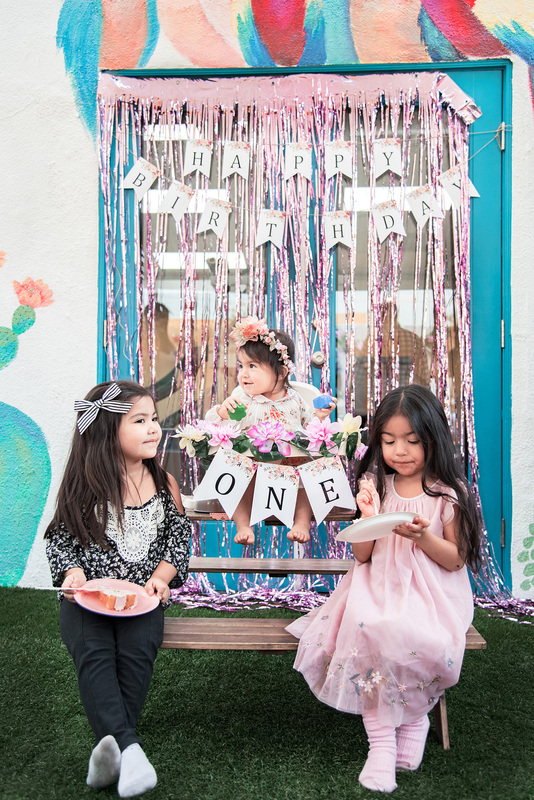 My advice for anyone hosting a birthday party for a toddler is to keep it simple. The décor and food can always be over the top but you’ll only stress yourself out. 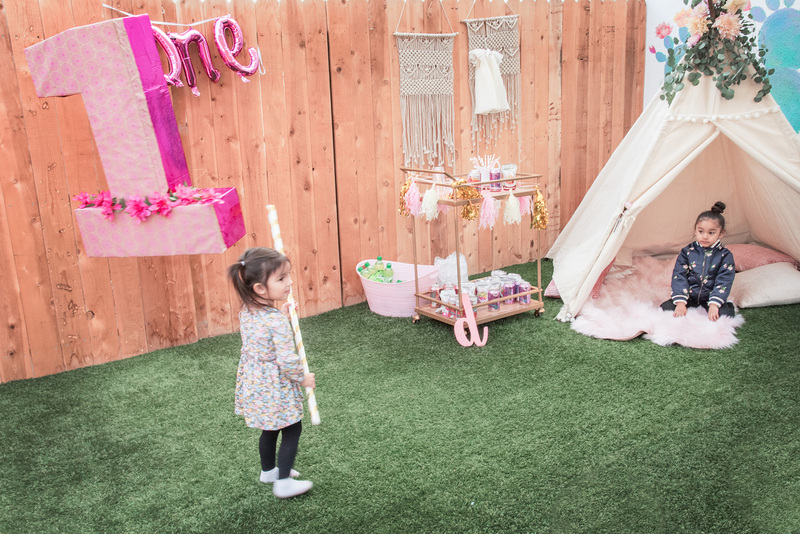 Dahlia’s first birthday party was two hours long and I planned it around her nap schedule. She enjoyed it to the fullest and I got to enjoy her! I hope you enjoyed this post! 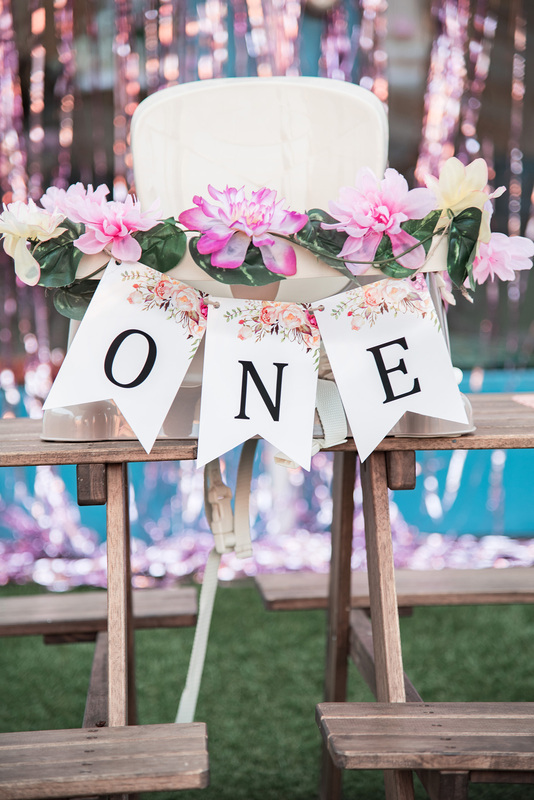 If you are planning a floral birthday party or floral theme celebration please pin your favorite pictures from this post to your Pinterest board! 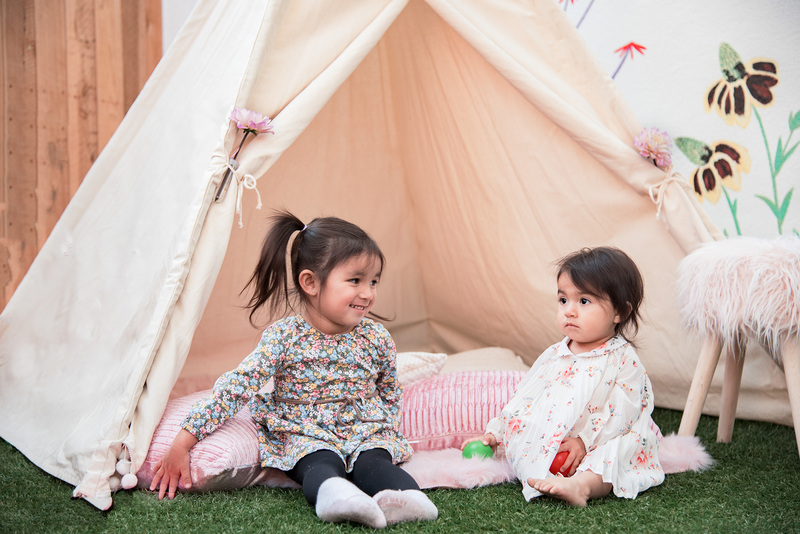 Tee Pee: Sleepie Teepee, LLC —use code “Dahlia” for 20% off your next party! 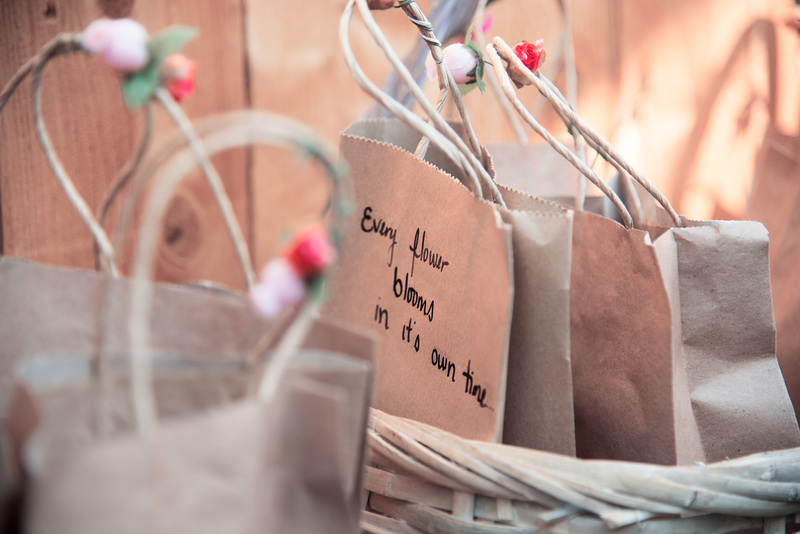 I’m curious what you put in the goody bags? 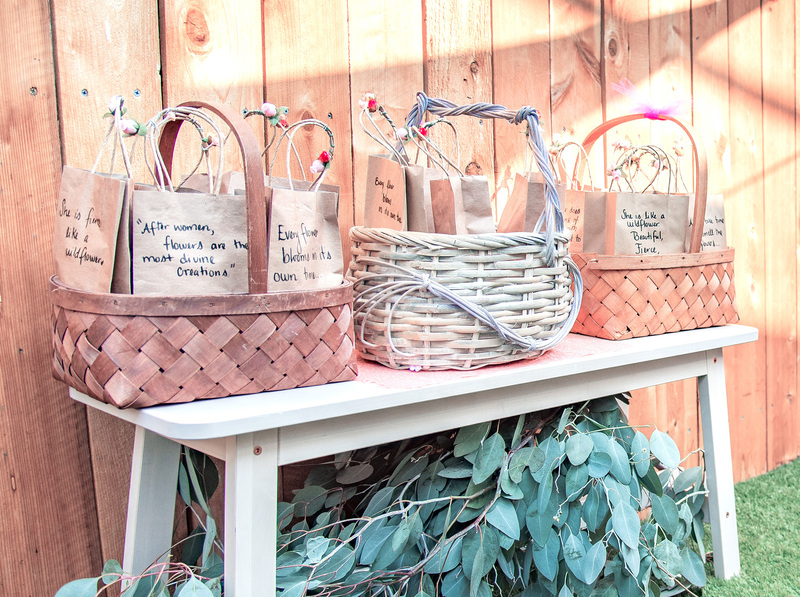 The goody bags had flower crowns, Knott’s Berry Farm shortbread cookies, applesauce pouches and honest fruit juices.